WALNUT ? I think most of you have heard before & for sure, eat before the tasty walnut. Maybe walnut cake, walnut drinks or just handful of walnut. However, how much do you know about WALNUT ? 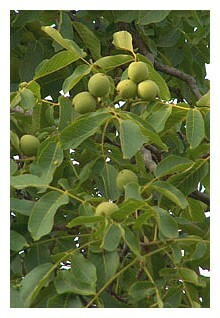 A walnut is an edible seed of any tree of the genus Juglans, especially the Persian walnut, Juglans regia. 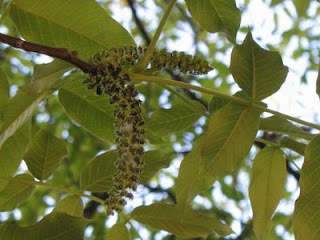 Broken nutmeats of the eastern black walnut, from the tree Juglans nigra, are also commercially available in small quantities, as are foods prepared with butternut nutmeats. Walnut seeds are high density source of nutrients, particularly proteins and essential fatty acids. Walnuts, like other tree nuts, must be processed and stored properly. Poor storage makes walnuts susceptible to insect and fungal mold infestations; the latter produces aflatoxin - a potent carcinogen. Mold infested walnut seed batch should not be screened then consumed; the entire batch should be discarded. In certain parts of the world, walnuts are locally known as walnüsse, noix, nuéz, nuc, ceviz, akharōṭ (अखरोट), kurumi (胡桃), hétáo (核桃). Walnuts are rounded, single-seeded stone fruits of the walnut tree. The walnut fruit is enclosed in a green, leathery, fleshy husk. This husk is inedible. After harvest, the removal of the husk reveals the wrinkly walnut shell, which is in two halves. This shell is hard and encloses the kernel, which is also made up of two halves separated by a partition. The seed kernels - commonly available as shelled walnuts - are enclosed in a brown seed coat which contains antioxidants. The antioxidants protect the oil-rich seed from atmospheric oxygen so preventing rancidity. There are two major varieties of walnuts grown for its seeds — the English walnut and the Black walnut. The English Walnut originated in Persia, and the Black walnut is native to the United States. The Black walnut is of high flavor, but due to its hard shell and poor hulling characteristics it is not grown commercially for nut production. The commercially produced walnut varieties are nearly all hybrids of the English walnut. Walnuts are revered since ancient times as symbol of intellectuality since their kernels have convoluted surface inside the shell resembling as that of brain! The nuts are enriched with many health-benefiting nutrients, especially Ω-3 fatty acids that are essential for optimum health. The nuts are edible kernels of the fruits from tree belonging to Juglandaceae family, in the genus: Juglan. Juglan species plants are medium sized, semi-tropical, deciduous trees believed to be originating in the mountain ranges of Central Asian or southern Europe region. There exist at least 30 varieties of walnut cultivars. The three most popular verities grown for commercial purpose are the English or Persian walnut (Juglans regia), the Black walnut (Juglans nigra), and the White or butternut walnut (Juglans cinerea). Commercially, the nuts are being cultivated in the United States of America, Romania, France, Turkey, and China. After plantation, the plant takes approximately four years until it produces its first major crop. During each season, the fruits are ready for harvesting by August when the thick green hull begins to crack to expose the light brown colored “in shell” (with shell) walnut. Each nut is roughly spherical in shape, about the size of medium sized lemon weighing about 10-15 g enclosing ediblekernel. In structure; the walnut kernel consists of two uneven, corrugated lobes, off white in color and covered by a paper thin, light brown skin. The lobes are partially attached to each other. Oil extracted from the nuts, apart from cooking, has also been used in as base or carrier oil in medicine, and aromatherapy. They are rich in monounsaturated fatty acids (about 72%) like oleic acid and an excellent source of all important omega-3 essential fatty acids like linoleic acid, alpha linolenic acid (ALA) and arachidonic acids. Regular intake of walnuts in the diet help to lower total as well as LDL or “bad cholesterol” and increase HDL or “good cholesterol” levels in the blood. Research studies suggest that Mediterranean diet that is rich in mono-unsaturated fatty acids and omega-3 fatty acids help to prevent coronary artery disease and strokes by favoring healthy blood lipid profile. Eating just as much as 25 g each day provides about 90% of RDI (recommended daily intake) of omega-3 fatty acids. Research studies have suggested that n-3 fatty acids by their virtue of anti-inflammatory action helps to lower the risk of blood pressure, coronary artery disease, strokes and breast, colon and prostate cancers. Scientists at University of Scranton, Pennsylvania have recently discovered that walnuts have highest levels of popyphenolic antioxidants than any other common edible nuts. 100 g of walnuts contain 13541µmol TE (Trolex equivalents) of oxidant radical absorbance capacity (ORAC). Eating as few as six to seven average sized nuts a day could help scavange disease causing free radicals from the body. In addition, they are also excellent source of vitamin E, especially rich in gamma-tocopherol; contain about 21 g per 100 g (about 140% of daily-required levels). Vitamin E is a powerful lipid soluble antioxidant, required for maintaining the integrity of cell membrane of mucus membranes and skin by protecting it from harmful oxygen free radicals. They also very are rich source of minerals like manganese, copper, potassium, calcium, iron,magnesium, zinc, and selenium. Copper is a cofactor for many vital enzymes, including cytochrome c-oxidase and superoxide dismutase (other minerals function as co-factors for this enzyme are manganese and zinc). Zinc is a co-factor in many enzymes that regulate growth and development, sperm generation, digestion and nucleic acid synthesis. Selenium is an important micronutrient, which functions as co-factor for anti-oxidant enzymes such as glutathione peroxidases. Walnuts oil has flavorful nutty aroma and has an excellent astringent properties; helps to keep skin well protected from dryness. It has also been used in cooking, and as “carrier or base oil” in traditional medicines in massage therapy, aromatherapy, in pharmaceutical and cosmetic industry. The walnut is not only good for cooking - they are healthy nuts that can also help your heart. The Food and Drug Administration(FDA), recognizing the cholesterol-lowering properties of walnuts, accepted a petition filed by the California Walnut Commission in March 2004 to list the health claim that walnuts can aid in reducing cholesterol levels. Through many studies performed by various research institutions all over the world, the benefits of walnuts have now been discovered. Not only has the consumption of walnuts proven beneficial in lowering cholesterol levels, they have been also noted to reduce the risk of heart disease and inflammation. 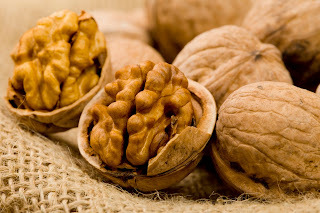 Walnuts demonstrate heart-healthy benefits due to the presence of high amounts of omega-3 fatty acids and phytosterols. Omega-3-fatty acids reduce triglycerides levels and only slightly reduce LDL levels (low density lipoproteins, also know as the bad cholesterol). Phytosterols appear to slightly lower LDL cholesterol levels, however, the mechanism by which it does this is not entirely known. In fact, walnuts contain the highest amount of omega-3-fatty acids in 1 ounce of nuts (i.e. one handful) in comparison to other nuts (2.5 g of omega-3-fatty acids versus less than 0.5 g found in other nuts). In addition to heart healthy ingredients, walnuts also contain a wealth of other nutrients, including vitamin E, the B vitamins, fiber, and several minerals. Many of the studies performed suggest that you only need to consume only a handful of walnuts a day to receive the cholesterol-lowering benefits of walnuts. The FDA agrees with this health claim, which will be on every bag of walnuts you purchase and will state the following: "supportive but not conclusive research shows that eating 1.5 oz of walnuts per day, as part of a low saturated fat and low cholesterol diet, and not resulting in increased caloric intake may reduce the risk of coronary heart disease. 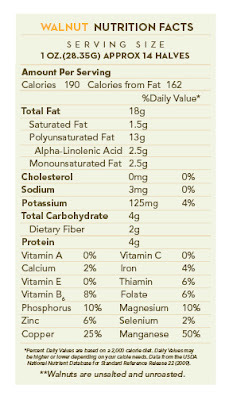 See nutrition information for fat [and calorie] content." Many studies have indicated the usefulness of walnuts in reducing cholesterol levels. 1. The first study involving the benefits of walnuts was performed at Loma Linda University in 1993. This study revealed a controlled diet containing walnuts reduced LDL cholesterol significantly in comparison to the Step One diet produced by the American Heart Association. The controlled diet was a modified version of the Step One diet, with the exception that walnuts replaced the fatty acid portion in the diet. 2. A Harvard study outlining the benefits of nuts concluded that high dietary nut consumption decreased the risk of sudden cardiac death in 2002. 3. In addition to this, many studies have elucidated the benefits of consuming walnuts and other omega-3 fatty acid-containing foods, citing that consuming high amounts of these products reduced the risk of stroke and clogging of arteries. The bottom line is that walnuts are a healthy snack packed with important nutrients that can help keep cholesterol levels -- and your heart -- healthy. Most studies have shown that it takes only one handful daily to achieve this effect. Eating walnuts can help fight depression, lower cholesterol levels and help with weight loss because of their high levels of omega-3. An excellent source of protein, walnuts are high in fiber and rich in vitamins, minerals and antioxidants. The benefits of eating walnuts, or using walnut oil, come from the fact that walnuts are one of the best sources of omega-3 fatty acids. Eating walnuts can lower cholesterol and tryglyceride levels, lower the risk of heart disease, combat depression and help with weight loss. Other health benefits include healthy bones and lower blood sugar levels. Walnuts and walnut oil contain more omega-3 than any other nut around. Apart from lowering triglyceride levels, omega-3 is particularly important for the brain to function properly. Studies have shown that eating more omega-3, either from walnuts, walnut oil or fish, can significantly lower depression. Many people who suffer from depression have low levels of omega-3 in their bodies. Several other studies have also linked omega-3 deficiency in children with attention deficit hyperactivity disorder (ADHD). The type of omega-3 found in walnuts and walnut oil is different to the type found in fish. Fish contains the EPA and DHA omega-3, while walnuts contain ALA or alpha-linolenic acid which is also found in flaxseends. 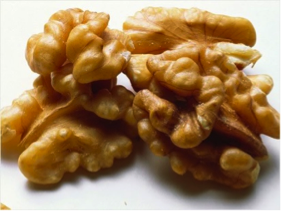 The body can theoretically make EPA and DHA from the ALA found in walnuts. The health benefits of walnuts also include weight management. Studies at Loma Linda University have shown that eating a few walnuts before a meal can decrease appetite and may cause people to eat less. Walnuts are nutritionally dense so they also provide a good dose of daily nutrients. Walnuts are rich in protein, B vitamins, vitamin E and magnesium, calcium, potassium and manganese which is essential for growth and peak brain functioning. The FDA has recognised the benefits of eating nuts to control heart disease. Nuts that contain less than 4g of saturated fat per 50g include walnuts, pecans, hazelnuts, almonds, pistachios, peanuts and pine nuts. A study in 2009 published in the American Journal of Clinical Nutrition showed those who ate walnuts had a significantly higher decrease in total cholesterol and LDL cholesterol. The study also showed that walnuts provided good levels of antioxidant protection with no adverse effects on body weight. A handful of walnuts provides 2.5g of ALA, the plant-based source of omega-3, 4g protein, 2g fiber and 10% of the daily recommended allowance of magnesium and phosphorus. Some people hold the notion that all nuts are the same. This is especially untrue for walnuts; these unique nuts are made up of mostly polyunsaturated fatty acids—both omega-3 and omega-6—while nearly every other nut is composed predominantly of monounsaturated fats. Moreover, walnuts are the only nut with a significant quantity of ALA, a seed oil that must be acquired through diet. Raw walnuts also have a remarkably high level of antioxidants. Walnut trees have been cultivated for thousands of years in different parts of the worls and have many types from varying origins. The walnut tree originated in India and Caspian Sea regions, while North Americans cultivate black and white walnuts in recent times. At present, China is the largest commercial producer of walnuts in the world. In Oriental and Chinese medicines, these are used for treating frequent urination, constipation, knee pains, cough, and asthma in the form of internal use. Walnuts are also used in external application medicines for problems like hair loss, acne treatment, and dandruff and skin inflammations. It is also used in as an ingredient in variety of foods and other medicine. Walnuts have plenty of monounsaturated fats and maximum of this is oleic acid, which is Omega-3 and Omega 9 fatty acid helpful in keeping heart healthy. 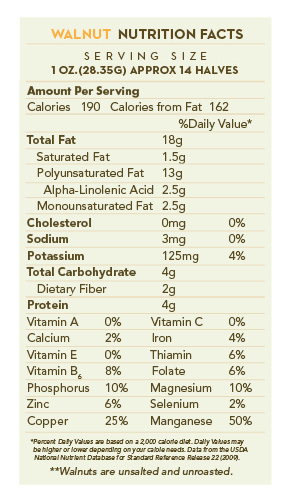 The ratio of omega 3 in walnuts is much more then in any other available nuts. The function of Omega-3 in our body is to prevent arteries from blockage, keeps them soft and flexible and increases blood flow to heart and body. Its oil is useful in avoiding a joint disease called arthritis and has been used commonly. Due to the available fatty acids and anti oxidants, the risk of breast cancer development is much reduced. Walnuts are an important resource for getting antioxidants especially Ellagic acid which are found in kernels. Ellagic acid helps in defeating that dangerous substance in our body which causes cancer. It also prevents the production of cancerous cells. In addition of the antioxidant activity, the plenty of polyphenols support the immune system. Walnuts are great reservoir of nutrients including protein, vitamin E, Vitamins B and fiber. As a source of dietary fiber, walnuts maintain digestive system and protein helps in building muscles. Walnuts also have many minerals just like all other nuts too have these in different ratios. These minerals include manganese, copper, phosphorous, zinc, calcium and Iron. Walnuts protects against memory loss. Magnesium has an important role in muscle contraction and relaxation and energy production. Phosphorus boosts kidneys function and controls regular heartbeat. Potassium is also needed in building up the muscle. Zinc is needed by immune system and copper manages nerve and immune system and keeps bones healthy. Manganese regulates blood-sugar level and Selenium prevents cell damaging. Researcher and doctors recommended adding walnuts into our daily diet to help avoid breast cancer. Eating walnuts regularly helps improving heart health and maintains sexual vitality in men. Walnuts are helpful in reducing bad cholesterol levels. Walnut oil when mixed with olive oil provides a good solution for healthy, shiny hairs. Almonds are also very good for keeping skin freshness alive because the presence of vitamin B1, vitamin B2, vitamin B3, E and niacin keeps skin away from radicals; hence slowing down the aging process in skin and body.